For far too long, our treatment of those convicted of crime has been too dependent on punishment and very little or nothing on rehabilitation. Although we claim to be a civilised country, we have the largest prison population in Europe, an unenviable statistic, where inmates are crammed together in overcrowded and unsanitary conditions with violence and tension bubbling just beneath the surface. I remember five years’ ago, when David Cameron became Prime Minister, one of the many broken promises he trumpeted aloud during his first days in office was his intention to significantly reduce the prison population, which then stood at 82,000 inmates. According to the Howard League for Penal Reform, it is now in excess of 86,000. Some reduction, some promise!! Why do politicians make these grandiose statements if they don’t keep them? According to statistics, over 40% of prison inmates are re-offenders, a depressing statistic. But help is at hand. Michael Gove, the newly appointed Lord Chancellor, has set about reforming almost everything within his remit with revolutionary zeal, and for the most part, he gets my vote. One of the reforms he proposes introducing into prison life is the right of inmates to possess as many books as they like (files excluded). Admittedly he had a strong nudge in the right direction by a ruling in the High Court that a ban on books was unlawful, but he has embraced the ethos of Vitruvian Man by treating prisoners as assets, not liabilities. “Every individual has something to offer,” he said, “every one of us can earn respect. People who are currently languishing in prison are potential assets to society. They could be productive and contribute. If we look at them only as problems to be contained we miss the opportunity to transform their lives and to save ourselves and our society both money and pain.” Wise words indeed. We all know that the pen is mightier than the sword, and a better educated prisoner is less likely to re offend. He is more likely to offer a real prospect in his life outside, and one that will benefit not just him but society as a whole. I hope Gove will not stop there, as there is so much more he can do with prison reform. First and foremost, if he is to pay more than lip-service to Cameron’s broken promise, is to significantly reduce the prison population, and this can be achieved, almost overnight, by directing judges not to send so many convicted criminals to prison for even the slightest demeanour. Since we abolished hanging back in 1964, imprisonment became the sentence of last resort, supposedly the ultimate deterrent. But it is now used routinely and far too often, with sentences getting longer and longer, and tempting though it may be, we can’t blame the judges. They are the victims of political gerrymandering as successive governments play to Middle England and their wish to see more and more draconian sentences. As for Middle England, it’s an unrepresentative class of petty-minded and bigoted individuals with ‘holier than thou’ attitudes and a “throw away the key” mentality. I remember one Middle Englander telling me that if we hanged them, they wouldn’t do it again. Compelling logic if nothing else. For my part, I deplore these rehearsed ‘bleeding heart’ speeches by relatives of the victims of crime on the steps of the court. They know little or nothing about the criminal justice system, they are preyed upon by police officers and social workers who have their own agenda, and it suits all of them to parade their bigotry and prejudices for all to hear. And nobody wants to hear them, nobody could care less. Most judges administering the criminal justice system have been in practice at the Criminal Bar for at least twenty years, often longer, so they know the system, they know what is right and wrong, what is fair and unfair, so I say to Gove and Middle England, let the judges get on with what they are paid to do, and if they get it wrong, there’s always the Court of Appeal. So I say to the government, tear up the sentencing guidelines, stop interfering in the judicial process, remember that the judiciary is supposed to be independent of the executive, and above all, stop sending so many offenders to prison. It doesn’t work, it’s expensive, and in the long run, it’s counter-productive. I started my private practice after pupillage in July 1975 at 4 Brick Court Middle Temple. I joined the Midlands and Oxford Circuit and moved chambers in 1986 to 6 Kings Bench Walk Inner Temple. Throughout this time I was specialising in criminal law. I also joined the Irish Bar. I moved to Birmingham in 1994 to 6 Fountain Court where I stayed until 1996. During my time in the West Midlands, I had a weekly column in the Birmingham Post. I then decided to relocate in the West Country practising from Taunton, where I am still practising. In 2004 I became accredited by the Bar Council as a Public Access Barrister, and at the same time I took the decision to diversify my practice into general common law. This includes Contract, Tort, Personal Injury, Matrimonial and Landlord and Tenant. Although I accept instructions on motoring matters, I have effectively given up my criminal practice. I have been in continuous private practice since 1975. As I established myself in the public access field, I set up my own chambers as a sole practitioner in 2009. I hit the headlines nationwide and made legal history in 1991 when I delivered my final speech entirely in verse. For this tour de force I was dubbed the Barrister Bard. I also made legal history, again, when I called an Amazonian Blue parrot to give evidence in court. I am the author of three humorous books on the law. I can be contacted at Combe Ford, Combe Florey, Somerset TA4 3JD (01823 430146) or by email at: david@david-osborne.com. 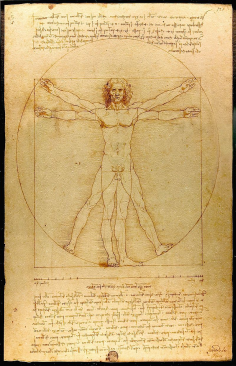 Article picture: The Vitruvian Man by Italian painter, draughtsman, inventor and writer Leonardo Da Vinc.